A 37' composite bridgedeck cruising catamaran. This 37' cruising catamaran intended to go into production but it never happened. It is composite construction with tiraxial roving and foam core. This design combines a spacious interior with quite good performance. The flared hulls allow an interior that feels expansive, but the cat still has a slender waterplane. That helps performance. Find full headroom in both the bridgedeck and the hulls. The hulls are up to 68" (1.72 m) wide inside. Unlike many less serious cruising cats, all the controls are easily reached from the helm. The helm is raised to provide visibility in all directions. The kickup rudders and deep boards give superb pointing ability, yet the cat can be easily beached. It is shown with the standard rig. A light weather rig is also available. A total of 5 different interior arrangements were created. Two are shown below, with part of a third one. The house, bulkheads, and all horizontal surfaces are created on a flat glassing table for rapid construction. 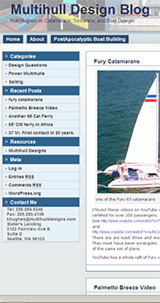 For more see 37 catamaran story. Also see the one being built from molds for production in Brazil. See www.barracudanautica.com.br.